I just finished my second batch of these and will probably make a third sometime in the next couple of days… they’re that good! I am not a chicken enchilada connoisseur by any means, but think these are pretty darn tasty! After my first batch came out of the oven, I decided I wanted to add a little sauce on top, so I whipped up a quick & hot enchilada sauce that turned out to be a nice addition. The only thing that I did differently the second time, was to make the enchilada sauce just before the dish was ready to come out of the oven. However, you can skip the sauce if you’d like. This recipes serves four, so simply double the ingredients if you need to make more. Lightly grease a 8×8 glass baking dish. Melt butter in a small saucepan & add onions; cook until soft or desired doneness. In a medium saucepan over medium heat, combine cream cheese, salsa, cream of chicken soup, green chilis, chili & chipotle powder and cook until melted/blended together. Add chicken and sautéed onions. Put a little of the chicken salsa mixture on bottom of pan (this step is optional). Lay out tortillas & spread a few heaping tablespoons of mixture and 1/4 cup of cheese down center of one tortilla. Roll jelly-roll style and place filled tortilla, seam side down in dish. Spread remaining chicken salsa mixture evenly on top of enchiladas. Uncover, sprinkle with additional cheese. Add black olives and diced tomatoes (optional). Bake for an additional 10 minutes or until cheese melts. 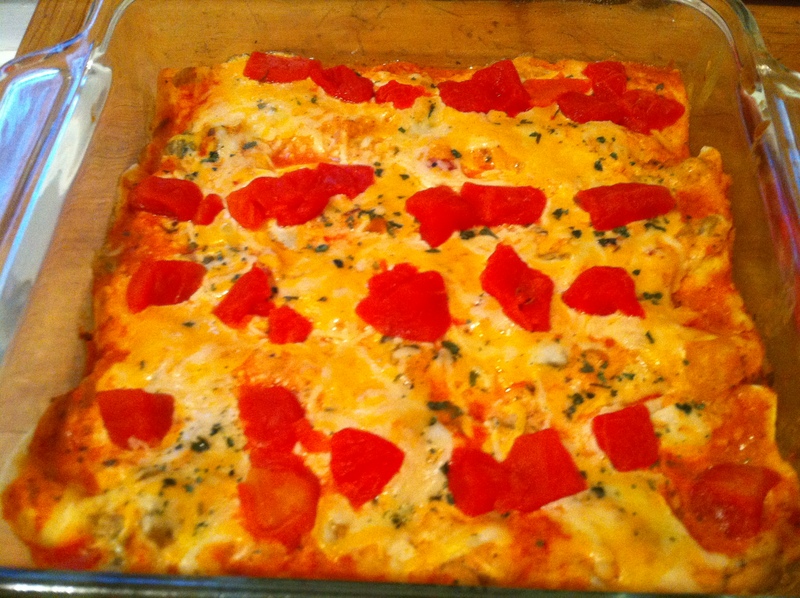 Remove from oven and serve immediately with or without enchilada sauce. In a small saucepan, combine enchilada sauce, sour cream, salsa and corn starch over medium heat, until blended and bubbly. This entry was posted in Chicken, Main Courses / Dinner, Recipes, Sauces, Condiments, & Marinades and tagged chicken, cream cheese, enchiladas, recipes, salsa. Bookmark the permalink.